Meridian Stress Assessment System (MSAS) testing (or Biomeridian testing) measures the energy at the meridian points, which are points located along a system of 20 lines or channels throughout the body. This allows the practitioner to determine probable areas of imbalance in one’s body. This technology is non-diagnostic, however it gives practitioners more information to consider in balancing their client’s energetic disturbances. Specifically, an objective profiling tool called Bio-Reportorization is used to identify major body systems and organs that are stressed or weakened, what homotoxicological phases are involved, and what symptoms may be present within the identified phase. Remedies are then determined to best bring the client back to optimal health. The process involves a non-invasive baseline reading of 58 points on the hands and feet to provide a complete customized analysis of 14 organs and systems in the client’s body. Further points may be tested for other specific health concerns. 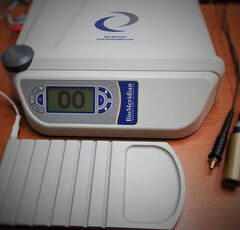 The machine used for Biomeridian testing is a GSR (Galvanic Skin Response) device that is regulated by the United States Food and Drug Administration (FDA) and is classified as a Class IIa medical device. It has been granted an FDA 510(K) market clearance.